I held off joining any knitting swaps during the autumn to focus on making Christmas gifts and items for the Etsy shop along with trying to keep within my budget (for once...). But I've been itching to join another. This one is perfect -- it doesn't start until after the holidays and it's run by Amy, a terrific hostess. Here are my answers to the swap questionnaire. I hope this helps my swap partner get to know me better! I used to. I'd like to get back to it sometime. Please, no synthetics, even just as part of a blend. No novelty yarns... eeek! A swap partner sent me a skein of Handmaiden Big Sea Silk but I haven't had a chance to knit with it yet. It feels heavenly. Greens (but not kelly green), reds, most blues. I like most colors. Colors that you don’t like? Kelly green, mustard yellows, wimpy pastels. I don't really have enough time to work on really complicated stuff. I tend to like bags, hats, some sweaters, that sort of thing. I love felting. Eeeek! How many hours are left before Christmas? Eeeek! I'm in the early stages of a Hogwarts (Weasley) sweater for Tommy. I must get it done by Christmas! And I was hoping to do more, but fear I'm pretty much out of time. 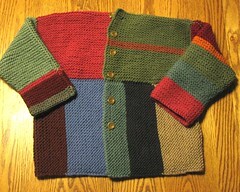 I did a big felted tote in lots of stripes for my sister about 4 years ago (pre-Ravelry, so I don't have photos). I liked how it turned out. And I made an Albert Jacket to donate to Warm Woolies this fall. I used lots of bits and pieces of Mission Falls 1824 wool. It's fun and very colorful. Nothing that I can think of right at the moment. Do you have a yarn winder and/or swift? Yes. Various ways. Needle holders, a big Tupperware container. Yes. Cookbooks. Depression era kitchen stuff. Old linens (especially Depression era). Yarn! Fabric. Yes, but I'm trying to eat them in moderation. Dark chocolate and maple are my favorites. Green tea, lemon, Lily of the Valley. Are you having a birthday during this swap? Nope (September). There's a link to my amazon wish list on the right side of the blog. I don't know about Loopy Ewe -- will have to investigate. I'm married. My son is going to college and has his own apartment about 45 minutes away. We have one dog (Winston - Golden Retriever) and 6 cats. Nothing that has to do with the swap. Here's my Swap-bot profile -- it'll tell you more about me (if you're curious). Also there are lots of other questionnaires listed on the lower right side of this blog. Feel free to ask any questions you'd like!